The Japanese Hino Team Sugawara crewed by Teruhito Sugawara and Mitsugu Takahashi finished SS11 at 9th place overall and 1st place in the Under 10-liter class for an accumulated overall ranking at 9th place. 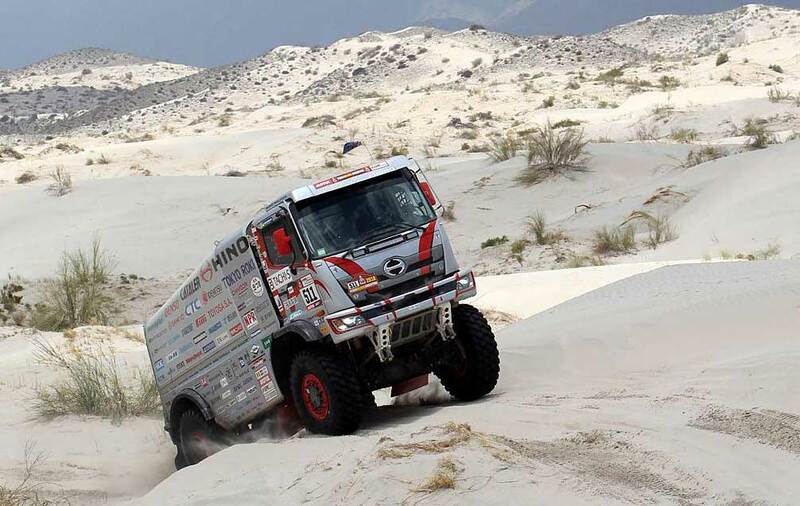 While the Hino 500 Series truck was the 13th to start the SS and suffered a flat on its front-right tire in a dune area at the beginning of the SS, it had climbed to 8th position by the time it reached the checkpoint (CP) and completed the remainder of the first segment in great form. "It was unfortunate that we lost about 25 minutes because of the flat, but otherwise we raced pretty well," said Teruhito Sugawara after the stage. "We’ve been here at Fiambalá many times in the past, but this is really a tough area. We have three more days to go so we will give it our best." Navigator Mitsugu Takahashi added: "We focused our tire replacement rehearsals entirely on rear tires so I was alarmed when the front tire went out. Navigation-wise, things went smoothly since there were no difficult waypoints. The only thing was that, despite the relatively short distance, it was a long and tiring day because of our low average speed."